I woke up this morning to the news that the UK government has signed a £3.5 billion contract for the production of the Scout Specialist Vehicle. There had been rumblings for a while that the British Army was trying to push through at least one major procurement before the next election – Scout is supposedly boiler plate ready ‎and the announcement handily coincides with David Cameron’s trip to the NATO Summit where he can now say the UK is meeting its obligations and is tough on defence. Leaving aside whether the procurement of the armoured vehicle is good for the British Army or UK industry (that will be more than ably covered by my colleague Tim Fish) what struck me most this morning was the UK’s breakfast news coverage. For those that still get their news from the BBC (although I’m not sure who they are), they woke up this morning to hear that the UK government was investing £3.5 billion in buying nearly 600 new tanks. You could say that an armoured vehicle is an armoured vehicle, but there is a hell of a lot of difference between ‎a reconnaissance vehicle and a main battle tank – I don’t care whether you have a specialist interest or are Joe Public, it still matters. The mistake is symptomatic of a much deeper malaise in UK defence reporting by the general media, particularly when it comes to technology. In a recent Sunday ‎Times piece, a commentator suggested that the proliferation of RPGs and thermobaric munitions could mean that more airliners would be shot down over conflict zones in the future – no, no, no. In an age when the right facts are usually only a Google search away ‎it shows just how little interest there is in the general media in ensuring that they get the basic facts right when it comes to the topic of defence. I accept this might be because it isn’t seen as an important area of journalism, but if TV news and the newspapers are falling so short on a subject area in which I have some specialist knowledge, then how can I trust the reporting on other areas I care about but have no deep knowledge, such as health or welfare? Although I’ve mainly taken aim at the UK media, which is what I’m exposed to most, this does not appear to be a uniquely British phenomenon. Popping on to my Facebook feed overnight was an infographic from News Corps Australia posted by a friend living down under. 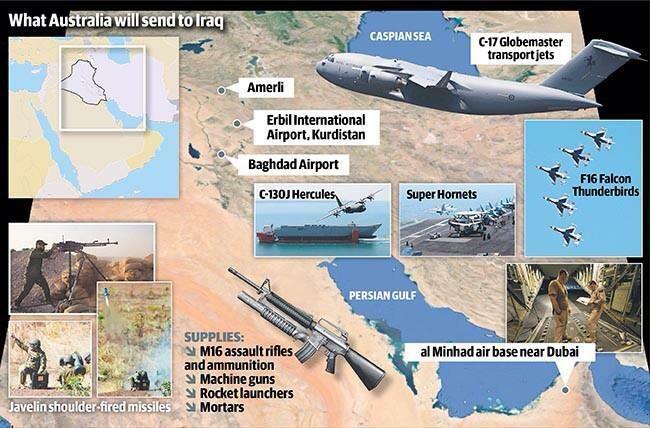 The graphic purported to be a handy reference to how Australia planned to fight back against IS in the Middle East. You could argue that the public often gets the news that it deserves. If there is no interest in defence matters then why should newspapers and news programmes invest in high quality reporting on the subject? But that misses one of the main raison d’etres that the fourth estate ascribes itself in western democracies, ‎particularly when it comes to some of its special protections – to keep the public informed on the facts behind political decision-making even when they don’t care. There is an old quote I recall vaguely that goes something like this: “every story you see in the media is absolutely true, except any that you actually know something about”. You will find some error in almost every story about which you have firsthand knowledge. Unfortunate, but true. But in the journalist’s defence, many errors are inserted back in the production cycle by production staff. For instance, I would guarantee that the F-16 gaffe you refer to above is the fault of some graphic designer or sub editor who misread the journalist’s note, and nobody knew enough about the subject to correct it. That’s not to excuse it – but I know for a fact that sub editors and other post-production staff can mangle a story long after the journalist has gone home for the evening. And many reporter has lost it after they saw what was done to their story after it was submitted. James, I agree entirely. But it also shows that the newspapers have scaled back on the kind of fact checking that was also a normal part of the production process. I certainly wouldn’t expect that kind of sloppiness to creep in with our production department here at Shephard Media – although its a given that they only have aerospace and defence to contend with! The issue of lack of accuracy in AeroSpace and Defence reporting is a global phenomenon. USA Today recently posted a video of an A380 as an illustration for a story on the A350. The main problem is that there are no major industry website or news organization that deals with “hot news”. Most of today online A&D media evolved from printed media which was organized to report, very accurately, but on a weekly or monthly basis. Therefore you will probably read about the UK “Tank” purchase in a detailed and correct matter in a defense publication next week. Way too late to correct the mistakes made in “hot news”. Without an “A&D” hot news site that could then be re-quoted by other traditional media, it leaves a vacuum of accurate information to be filled by less than qualified reporters and graphic artists. I wouldn’t agree there. Look at the speed and accuracy of the reporting of the likes of Aviation Week, Defense News, Flight, IHS Jane’s or ourselves and you’ll see that there are places to get the correct information very easily. Actually, I think you are unintentionally making my point. 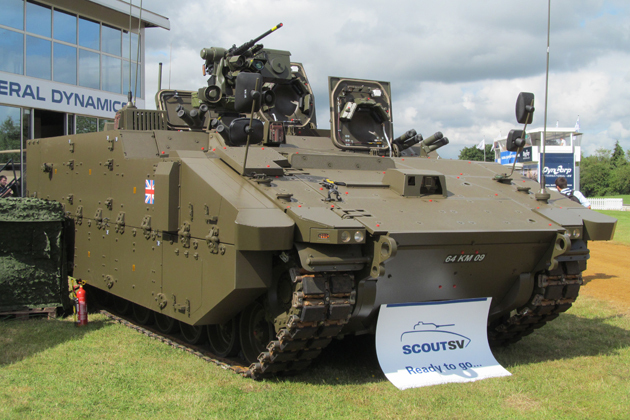 As of 14:34 UK Time, none of the sources on your list (including yours) had an article about the announcement, except for IHS Jane’s (but they posted an outdated picture of the Scout SV). So no, I don’t think the industry news is doing a good job with “hot news”. Actually I think you misunderstood my comment. Leaving aside IHS’ outdated picture (something I noticed as well). A quick check of any of those sources would have confirmed much of the back history of Scout and what to call the damn thing, which is most definitely not a tank.